HUNTLEY, IL – Huntley High School proudly announces their spring musical production of Fiddler on the Roof, running May 14 to May 17 at District 158’s Performing Arts Center, located at Huntley High School, 13719 Harmony Road, Huntley. Filled with unforgettable songs such as “Sunrise Sunset,” “If I Were a Rich Man,” and “Matchmaker,” the original Broadway production of Fiddler on the Roof ran for 10 years, and was performed before more than 3,000 audiences. It has had a very successful film adaptation and continues to enjoy great international popularity. Fiddler on the Roof finds a way to capture pure heartaches of life with both laughter and sentiment interpreted as the way to cope with adversity. 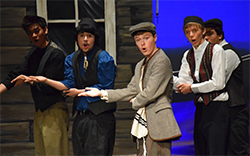 Based on a collection of Yiddish short stories about family traditions, Fiddler on the Roof presents the lessons of regret and optimism set in a poor Jewish village near the early 1900’s. Anatevka is a small place somewhere in Czarist Russia, and its incomparable Dairyman tells his story. Tevye aims to teach five strong-willed daughters the important values of their tight-knit Jewish community, but he first must navigate the free-flowing opinions of its members. There is his wife, Golde, and her compatriot, Yente the matchmaker. Next comes along Lazar Wolf, Anatevka’s feisty butcher. Never far removed are self-entertaining businessmen and beggars. Then as villagers and Jewish religious leaders comment on every matter, the entire village’s young people seem to find means to challenge deeply held traditions of Anatevka’s old ways. Soon, Tevye discovers outside opinions in the face of the changing social values. Performances will be held at 7:00 p.m. May 14, 15, and 16, as well as a 3:00 p.m. matinee on May 17, 2015. Tickets are $5.00 general admission and can be purchased online by selecting Performing Arts Center (PAC) – Order Tickets at www.district158.org or at the door 45-minutes prior to show time. Come see one of the most beloved, popular musicals of all time! Anyone requiring more information should contact Director Nancy Cross at ncross@district158.org, or Assistant Director Tom George at tgeorge@district158.org.